Manually identifying all such matching transactions can be tedious, boring & error-prone. This is where formulas come handy. 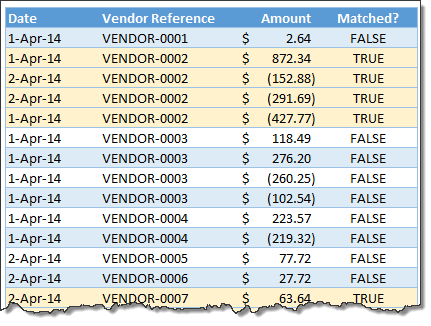 Using simple Excel formulas, we can identify all matching transactions, highlight them using conditional formatting so that you can chase the vendors with an outstanding. Note: thanks to Kirstin whose email question prompted me to write this article. This is how our AR (Accounts Receivable) data looks above (very first image in this post). For the sake of simplicity I have set up this data as an Excel table. Here is the criteria for matching. If the total amounts (paid & received) corresponding to a vendor is zero, we consider it matched. Add an extra column to the table and write this formula. The ROUND formula rounds it to 2 digit precision. We need to use this because of a floating point error in Excel (that returns extremely small values when the result should be zero). Fortunately, you don’t have to do this step. Excel automatically fills the formula down as we are using tables. Yay! Step 4: Highlight matched rows using conditional formatting. Make a note of the column where TRUE / FALSE values are calculated. In my set-up, it is column E.
Select the entire table. Go to conditional formatting > new rule from home ribbon. Note the mixed reference style $E4. This ensures that for highlighting all columns, Excel checks only column E.
That is all. You have now matched all the paid-up transactions. Time to flex your muscles, put-up your legs on the desk and call those other people who did not pay yet. Click here to download example workbook & practice. Examine formulas & conditional formatting to learn more. How do you reconcile / match-up transactions? I will be honest. I have never been the head of accounts receivable department. Even in my own household, I do not handle receivables. My wife takes care of that. I handle payables (ie credit card bills, shopping expenses and other such things). But I often use formulas to reconcile my bank statement. What about you? Do you use formulas to match transactions. What techniques you rely on? Please share your tips & ideas using comments. How many vendors have their transactions matched? Post your formulas in comments. I will use pivot table for above example. After pivot just use round formula to sum of amount. 18 vendors have their transactions matched. I agree with Utkarsh - a pivot table is likely the fastest way to handle it using this example. Personally I create a unique table of vendors, and then use SUMIFS formulas to bring in both the expenses and the payments into separate columns (because my ledger includes a description of type of transaction). 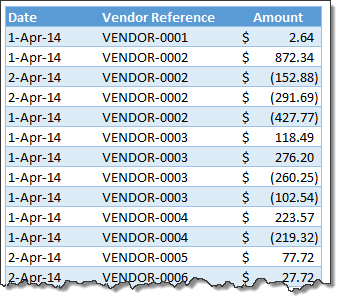 Fourth column (because the first column is the vendor name) is for difference between Invoice and Payment. I would also use a pivot table to solve this... But, great formula! "Simplicity is Elegance" like Albert Einstein said. I would use a Pivot Table too! I agree. A pivot table would be really simple & quick way to solve this problem. On second thought, there are occasions where you would want to delete or move the data that is zeroed out. To my knowledge, this cannot be done with a pivot table. Therefore, the formula approach would be MUCH better as you can then sort by the TRUE responses and move, delete, copy, edit, color, etc. the data. I have a worksheet where I do exactly that and I have changed it to include the formulas you suggest in this article! Thank you! I would also favor a pivot table. But thank you for the formula and conditional formatting example. I'm trying to learn more formulas because most of my coworkers do not like to use pivots and my boss usually likes to see the detail and how I got there from the raw data. Chandoo, Interesting. I have never seen the @function used in a formula like that. @[Vendor Reference. What exactly is the @ doing in the formula? Is it calling the entire column? Thanks for the comments. The @ function refers to vendor name in the current row (same as relative reference). hi chandu, could you please send me the excel sheet by putting this formula as I am not able to put this formula. please help. Hi! I would favor the formulas, as I have hundreds of vendors, it would be harder to anilyze this by pivot, with formulas I have the possibility to filter and include the document number also, as it is important to me. Also the mistake with the round up in the pivot be solved if we add another column in the initial data table and ask it to round up and use it for the sum in pivot. In this case we would not need to filter with 0,01. I know this is an additional step, but sometimes it is harder to explain why a person needs to filter not by zero, if you send the file to somebody. Also in this case if we filter excluding the zeros we will be able to see the negative amounts, for my country this will be also valid, as we are obliged to return overpayments by law. This is a great formula. I love the way it must include the same vendor in order for the calculation to work. How would I rewrite the formula if I had to include the same vendor, and exact DATE to match to produce a "true" result, otherwise anyhting else would be false? WOW! Thank you so much Herbert! This formula worked like a charm! i have two ledgers to be matched. and the second one is send by customer to me which he maintained himself . there is no negative signs in the ledger and they are in separate sheets. Hi Chandoo, why it has to be sumifs instead of sumif? Cheers! Is there a way to change the formula, I need it to show as matched if it equals 0 or is >-5.00 or is <5.00. Sorry, this did not come out correctly in the comment. Again not correct. Let me try one more time. This time one formula at the time. The second one worked great, but now I still need to narrow down my list. I would like a formula to show the first and second transaction as TRUE and just leaving transaction three as FALSE. 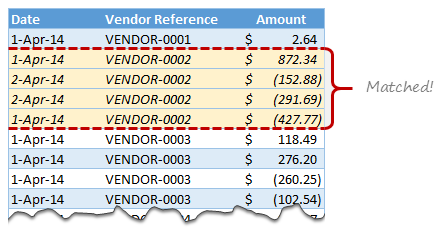 How can i match the transactions when i don't have any base such as vendor name- All that i have in an excel sheet are numbers?? okay.. I'm still not getting through with this. so I've got the Suppliers' column and two amounts that I want to double check.. How would my formula go? help please.. I wanted to say thank you for creating this formula. I have been looking for this formula for years. When I found out about this a few weeks ago, it made my work soooooo much easier and faster. I have to reconcile daily transactions just like the example and this formula just cut my work in half (or more). Thank you soooo much!!! Why do you need a round function? You dont need to round it to 2 digits. Cant you use the formula without it? Can you please show this formulae in excel? @[Venfor Reference] does this mean range?? It's not working for me. Everything comes up false when I know a lot of the lines arent. i was thinking of doing a vlookup of GST numbers. However i also need the correct invoice value corresponding to a particular invoice number. Can you please suggest a formula combining vlookup with some other formula. Or can you please suggest an alternate formula. This is an outstanding formula. I need additional assistance with this formula. I need the formula to true rows within a vendor reference that has an offset and false the rows that do not have an offset.